You Craft Me Up! 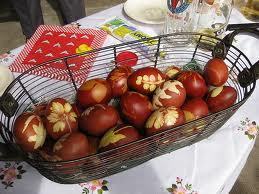 : Easter Eggs- Swiss Style! My husbands ancestors came from Switzerland. They joined the Mormon church, crossed the Atlantic and then the plains to Utah, and then headed south to settle in Santa Clara, Utah (St George area) They didn't bring much with them, but they did bring their traditions- one of which was dyeing easter eggs with roots and leaves and blossoms. 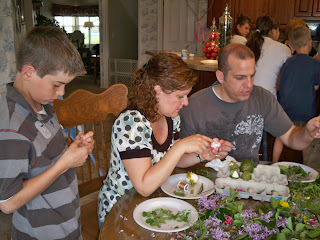 When I married my husband, this quickly became my favorite tradition from his family. This post is slightly selfish- I want to document the process so that I never forget how, and so my children will be able to pass it on as well. It is most commonly found in ditches along farm fields. 2. Once you have your root, remove the foliage, rinse off the dirt, and cut into 1-2" pieces. Be super careful!!! Remember- these are uncooked eggs! 8. When done, carefully remove the eggs and place in cold water to cool. 10. 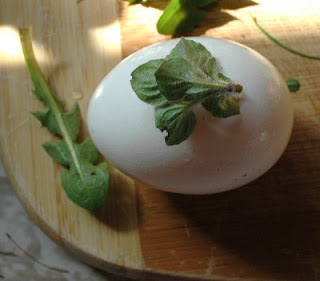 Wipe your egg clean and polish it with a paper towel that has a drop of oil on it- this will give it a beautiful shine! The best part is unveiling the surprise design! They are so pretty!!! Here are several pictures (my wonderful SIL took pictures!) Picture Overload- I just couldn't decide- I liked them all! No egg is ever the same as another! The blue comes from peach tree leaves! So pretty! 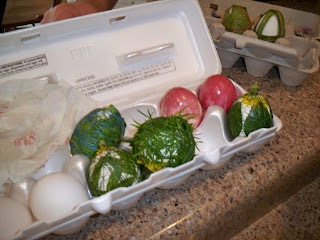 If you want to preserve these beautiful eggs for display- just write on the carton "do not eat" and put in the back of your fridge for a year. The insides will solidify and become dry (sometimes you can even hear the yolk rolling around like a rubber ball! If they crack they don't stink- the insides will be too dry. I hope you all have a very HAPPY EASTER!!! What a wonderful tradition! 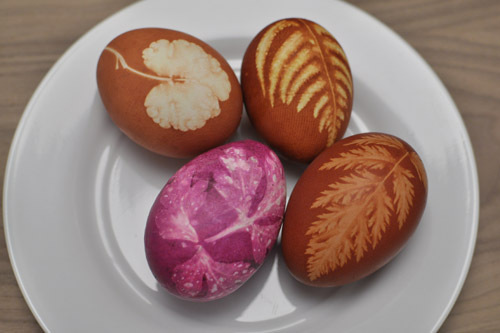 The eggs turned out beautifully. I can't wait to try it with my kids :) Thanks for sharing! What a cool idea to do altogether as a family. I saw just yesterday a blog post about the onion method and about a tea method but those are meant to be eaten so its a little different. Those eggs are beautiful! I'm excited to try it this year too. 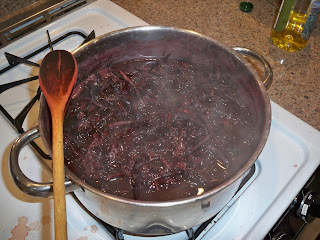 I'm thinking we don't have red root here in California, (I've never seen it anyway) so I will probably try the onion skin and beet method. Thanks for a such a detailed description of how to do it. I really enjoyed reading it and loved the pictures. We are Mormon also, and what a great tradition to start and send down through the generations! I tried it. I can't wait to try it again now that I have the hang of it. We tried this and it was a lot of fun. I posted it on my craft blog and linked back to you! Thanks for the awesome tutorial. This is a great blog about it. A lady just ask me today where she could get some madder root for her egg coloring. A great job on this article.